Earlier this month, after a negotiation lasting several years between the European Commission and the telecommunications companies, mobile phone roaming charges were abolished within the EU. This means that we can now all use our mobile devices anywhere within the Union exactly as we do at home: a great new ‘freedom to roam’. Deprived of the use of my phone, I had more time to reflect on some of the other aspects of the ‘freedom to roam’ that the European Union confers on its citizens. And at virtually every step, I found myself ruminating on the irony of Brexit. The first instance was on the Air Baltic flight from Gatwick to Riga. A Finnish woman in the row in front of us was anxious about her connecting flight to Helsinki. Her neighbour, a Latvian woman, was able to reassure her that she would have plenty of time to make it. They spoke to each other in English – I couldn’t help feeling dismayed at the fact that a nation that had given them this common language was about to turn its back on them. Our first night was spent in Bauska, a small town in the south of Latvia, not far from the Lithuanian border, where in 1881 our grandfather was born. My brother had done his homework and we followed his maps around town trying to learn more about what our ancestors’ early life might have been like. Bauska once had quite a large Jewish community. In 1935 there were 778 Jews registered there; after the Nazi invasion and Holocaust there were just 2. The town’s museum has a display remembering this and other lost minorities – Russians, Germans, Byelorussians – victims of the various waves of war and destruction that characterise the tumultuous history of this part of Europe. We then drove south into Lithuania on a minor route. It is a long time since I crossed an international frontier – in Europe – on a dirt road. There was no border post, no customs officials, just a couple of signs. 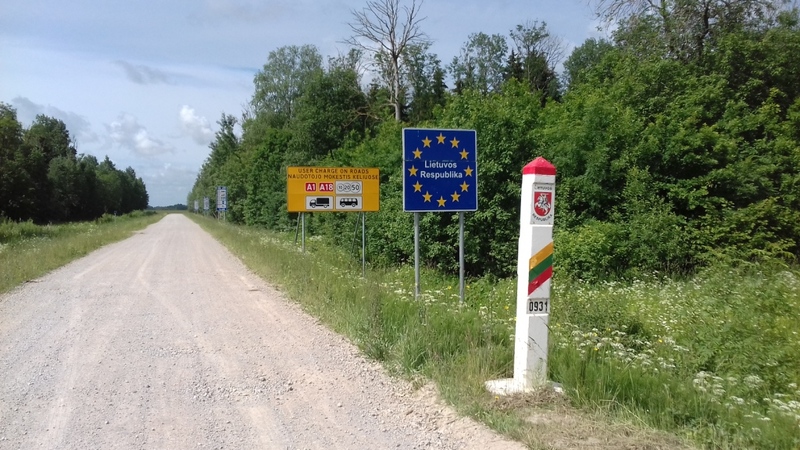 This was the border that my great-grandfather would have crossed when in response to increasing economic and political pressure on the Lithuanian Jews under the Russian Empire he left the family home in Lithuania in search of a better life in The Duchy of Courland – modern day Latvia. It was lucky for them that they had that freedom to roam or they would probably have succumbed to the disaster that befell the Lithuanian Jews under the Nazis: of the 220,000 living in the country in 1941 only 4% survived the Holocaust. We visited memorials to Jews who were murdered by the Nazis and their Lithuanian collaborators: for example on 6 August 1941 300 were shot and tipped into a mass grave not far from Linkuva, the small hamlet where my grandfather’s family had lived for several generations. This tragedy has to be seen in the context of Lithuania’s own history: a proud but small nation engulfed by successive waves of geo-political conflict in Europe from the 14th century onwards. Invaded by, among others, the Teutonic Knights, Napoleon, Hitler, and Stalin, ethnic Lithuanians only became a majority in their own country at the end of the Soviet era. No country in Europe better illustrates than Lithuania the importance of the political project that is the European Union, which was conceived primarily to ensure that such tragedies never befall our continent again. To be honest, as a British citizen visiting these countries for the first time I could only feel ashamed that the discourse about Brexit in this country so completely ignores this aspect of what the EU is designed to achieve. The debate focuses on narrow economic considerations without paying any attention to the bigger issues around protecting the citizens of Europe from future wars. And those in this country who naively believe that we can turn our back on Europe and leave them to their own problems ignore the lessons of the last 300 years, which show that whenever peace and security in Europe are threatened Britain has no alternative but to become involved: Napoleon, Hitler, Stalin were all as much challenges for us as for the rest of Europe. The idea that Brexit will change any of that is simply an illusion. So, we now enjoy our freedom to roam – but do we understand that this is about so much more than mobile telephones? Sitting in a café drinking excellent Lithuanian beer and enjoying a memorable meal in the rays of the setting Baltic sun my brother and I wondered whether our children would have the same opportunity that we have to enjoy without any constraints the diverse pleasures of our wonderful continent. Is there any chance that before we reach the end of the Brexit road – by which time it will be too late – we may come to see the bigger picture?